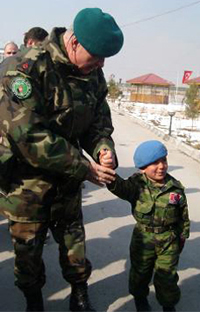 A little Afghan boy, Numan Rahman (right), is seen together with Brig. Gen. Levent Çolak (left), top Turkish commander in Afghanistan. Little Numan wearing Turkish military uniform is the mascot of the Atatürk military hospital in Kabul. Photo Credit: Hurriyet Daily News. The top NATO commander in Afghanistan, General Stanley McChrystal hailed Turkey’s role in Afghanistan during a meeting with visiting Turkish reporters. Praising Brigadier General Levent Çolak, the top Turkish commander in Afghanistan and current commander of the ISAF force that is guarding Kabul, he added: “Turkish forces are exactly where I think they should be. I think American forces and all forces in the coalition have learned a lot by watching them, emulating the way they operate in this environment,” said Gen. McChrystal. A group of 40 Turkish reporters were visiting Afghanistan on a trip organized by the Turkish General Staff. Speaking to reporters, Brig.Gen Colak dubbed Afghanistan a “witch’s cauldron” of potential threats – including suicide attacks, kidnapping, drug trafficking and ambushes. Prior to becoming commander of ISAF in Kabul, Colak has twice been stationed in Afghanistan as part of ISAF and has previously served on the Turkish force under the NATO peacekeeping mission in Bosnia and Herzegovina. The Turkish strategy includes distributing humanitarian aid, building medical facilities and schools and providing free medical services. Turkey also contributes to national capacity building in Afghanistan by providing to Afghan military and police officers, as well as key Afghan civil service personnel both in Afghanistan and in Turkey. One Turkish reporter summarized her observations from the visit stating that the Turkish military has instilled trust and respect among the Afghan population, making the Turkish flag a “badge of honor” in Afghanistan.